So what inspires me? Its hard to put in a fer words but I love the natural world ... the colour and texture; how it changes so rapidly. there is so much variety and beauty. Also very important to me is the simple things that so many overlook. 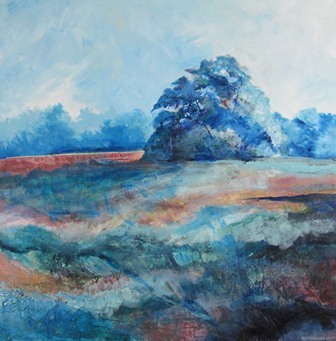 I have added an image (above) it is an everyday view of a magnifecent oak tree in an open field. Simple but totally stunning. That tree has been there for 100's of years and is totally unique. It caught my eye and the choice of colours reflect the warmth & happiness of the day. Also it is not a complicated colour scheme as the subject needs to speak for itself. The title of it - 'Look, See, Love' is what we all need to do with the simple and complicated within our awesome natural world. Really hope this helps. More of my thoughts can be found on the page 'The Artist'. All the best and keep painting!!! Comments for What Inspires You? My buddys notify me that they assignment help australia online. I get never accomplished this once moreover I would like to experience which place is utmost suited for this. I would hardly want to shop a treatise that has already been sold to additional one. this has been a great help and sure is insperational,i love the painting you included too! Join in and write your own page! It's easy to do. How? Simply click here to return to Gallery Questions.